Meet the Jersey Shore’s leading restaurateurs in Bielat Santore & Company’s online booklet, Who’s Who in the Restaurant Industry. Featuring over 40 New Jersey restaurants, the booklet contains interviews with restaurant owners, chefs, and partners highlighting the eatery’s success. Who’s Who in the Restaurant Industry is a press release series created by Bielat Santore & Company to promote area restaurants. Businesses featured in the series include: D’Jais Bar and Grill; Giamano’s Ristorante; Johnny Piancone’s; Ninette’s Italian Restaurant; Harpoon Willy’s; Langosta Lounge; Tommy’s Coal Fired Pizza; My Kitchen Witch; Tavolo Pronto; The Chapter House; Savoring the Shore; Basile’s Restaurant; The Bar Room & Grill; The Cheese Cave; San Remo; Monticello Restaurant; Shipwreck Point; The River Watch; Tipperary Pub; Michael Angelo’s; Forte Restaurant; Indulge Lounge; The Sitting Duck; Solo Trattoria; Windward Tavern; Brennen’s Steakhouse; Salt Creek Grille; La Dolce Vita; Mossuto’s Market & Café; Prohibition; Danny’s Steakhouse & Sushi; Rella’s Italian Restaurant; Rooney’s Oceanfront Restaurant; MJ’s Pizza Bar & Grill; O’Connor’s American Bar & Grill; New Jersey Restaurant & Hospitality Association; Johnny Mac House of Spirits; Christine’s Italian Ristorante; Manny’s Pizza, Subs, & Salads; Stone Mandia, LLC; Breakers Kitchen & Tap; B2 Bistro + Bar; Charley’s Ocean Grill; Fleming White Appraisals; Nettie’s House of Spaghetti. Click here to view the full booklet. 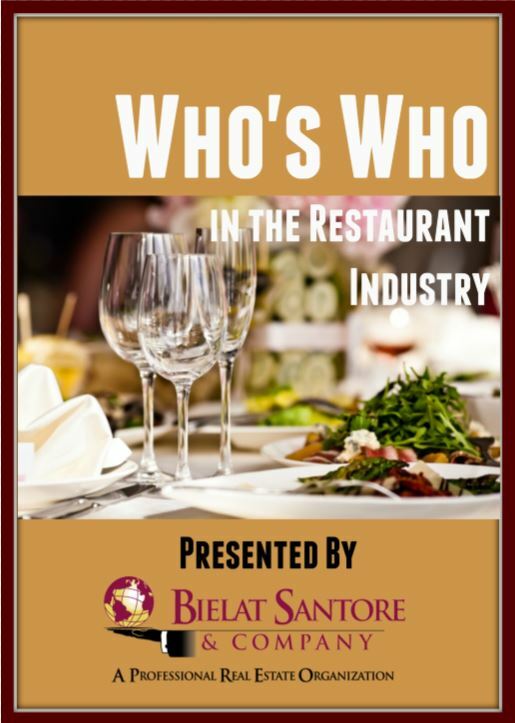 To be featured in the Who’s Who in the Restaurant Industry series, contact Courtney Ciandella at 732.531.4200.